This is the second in a series of articles discussing the causes of corneal opacifications. There are several possible differentials for corneal opacifications that do not stain with fluorescein. These include corneal pigmentation, fibrosis, calcium or lipid deposition, cellular infiltration, the presence of a foreign body, sequestrum, and/or edema. This article will concentrate on corneal opacifications due to lipid deposition. There are three differentials for corneal lipid deposition in dogs: an inherited condition termed corneal dystrophy, corneal degeneration, and lipoproteinemia. Typically, corneal lipid deposits do not adversely affect canine vision. However, long term complications of lipid and/or calcium deposition include secondary corneal ulcerations (which may progress to descemetoceles). Corneal dystrophy is the most common cause of lipid deposition in the canine cornea. In dogs, with corneal dystrophy a defect in keratocyte metabolism is thought to result in an accumulation of lipids within corneal fibroblasts. This accumulation also increases the rate of corneal fibroblast cell death. Corneal dystrophy is bilateral and the accumulation of lipid is gradual. The resultant corneal opacities consist of cholesterol, phospholipids, and/or fatty acids (Figure 1). Breeds predisposed to corneal dystrophy include the beagle, Siberian Husky, Cavalier King Charles cocker spaniel, rough collie, Sheltland sheepdog, and Airedale. Treatment options include lubrication to retard the erosion of corneal epithelia, and limiting the fat content in a dog’s diet to less than 10%. As a genetic condition, owners are also discouraged from breeding dogs with signs of corneal dystrophy. Corneal degeneration describes corneal lipid or calcium deposition secondary to ocular disease. In a dog, this type of lipid deposition is termed a secondary lipid keratopathy. Lipid accumulations are observed proximal to blood vessels, or in a fan-shaped opacity in advance of the vascular arcade. These deposits are typically unilateral, localized, and are associated with necrosis of corneal fibroblasts. Conditions associated with a secondary lipid keratopathy include ulceration, corneal rupture, keratoconjunctivitis sicca, episcleritis, chronic superficial keratitis, herpes keratitis, limbal tumorigenesis, surgical incision, and conjunctival grafting. Corneal degeneration can obstruct vision due to the size and/or position of corneal opacifications. Erosions of the corneal epithelia can also occur in these regions of opacification. Corneal lipid deposition secondary to a high concentration of systemic lipoproteins (lipoproteinemia) is the least common cause of corneal lipid opacification in dogs. Lipoproteinemia has also been associated with corneal lipid deposition in humans, rabbits, frogs, and rarely in cats. Experimentally, dogs fed a high fat diet do not significantly increase their corneal fat deposition, whereas obligate herbivores (e.g. rabbits) do. In dogs, corneal depositions associated with lipoproteinemia are typically ring-shaped and found within the perilimbal area. This characteristic opacification is therefore termed corneal arcus. 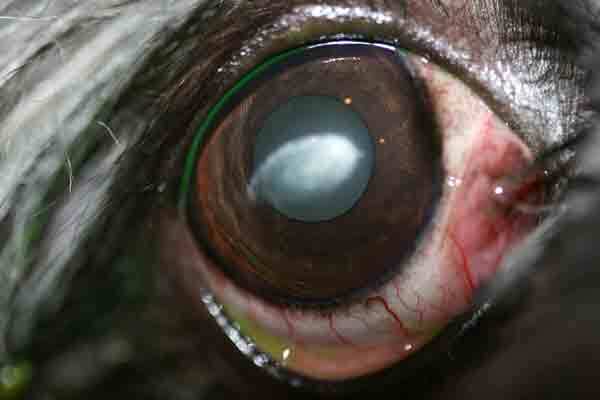 In dogs, corneal arcus initially develops within the peripheral cornea beneath the third eyelid. All dogs with a corneal arcus have lipoproteinemia, but not all dogs with lipoproteinemia present a corneal arcus. In dogs, hypothyroidism is the most common disease associated with lipoproteinemia that may result in corneal arcus. German shepherd and Rottweiler dogs are predisposed to hypothyroidism and subsequently corneal arcus. Corneal arcus can regress in these breeds as their lipoproteinemia abates with successful treatments for hypothyroidism. Corneal dystrophy, degeneration, and arcus are typically differentiated via slit lamp biomicroscopy, Schirmer tear testing, and fluorescein staining. If you have further questions concerning the differential diagnoses of corneal lipid deposition, please feel free to consult with a veterinary ophthalmologist. Figure 1: A healthy cornea is optically transparent.